Our stylists are trained to the highest standards possible. Our pricing structure is determined by their level of practical experience and there are five different levels showing this. Many of our stylists have extensive expertise in long hairdressing and can achieve the look you want whether it is for a special evening out or your wedding day. Wedding packages are available that include a consultation, trial and styling on the day. 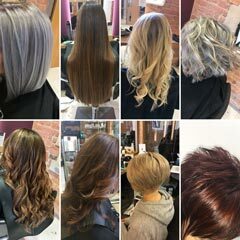 All of our stylists are on hand to offer you professional service to suit you individual needs, being able to give you this seasons latest look and provide you with the range of colours available straight from the catwalk using Redken products. Why not treat yourself to one of our salon conditioning treatments, taylor-made to ensure your hair is at its optimum condition. Whilst you hair is being treated you can relax in our shiatsu massage chairs. Redken offers a full range of care and styling products to suit all hair types and styles. Introducing their new range of aloe vera products for those with a sensitive or stressed scalp. Kerastase is a luxurious and prescriptive hair treatment, has the most advanced hair formulations and has pioneered the salon haircare industry for over 40 years. Keratin Smoothing Hair Treatment - A revolutionary Keratin treatment, that removes frizz and curl for 2 to 5 months adding shine, smoothness and gloss for healthy and youthful looking hair, without any damage. It gives immediate and lasting results, despite rain, humidity or perspiration. Creme Hair & Beauty offer qualified Kerastase Ambassadors and Redken specialists to provide an individual journey for our clients.